Monday. Again. Where does the weekend go? Blink of an eye, I tells ya! My sister-in-law informed me of some exciting news this weekend. Anthony Bourdain is coming to Newfoundland! YES, Anthony Bourdain – star of CNN’s foodie/travel show Parts Unknown! It’s one of our favourite shows. Have you ever watched? I think if I saw Anthony Bourdain in the street, I would have to go up to him and ask for a picture. Would I be one of those people who plays it cool and is like ‘yeah, whatever; he is only a celebrity.’ Nope. Like, when would I ever see him again?! Ha! Listen to me….I’m talking as if I’m actually going to meet him. If you saw a favourite celebrity of yours, how would you react? Now that I’ve got that off my chest, how about some delicious honey roasted peanut clusters?? These peanut clusters are pretty simple to whip up. And I used raw, natural honey. Buy the best you can. You won’t regret it. So creamy. So delicious. Basically, heat the honey, butter and cayenne on the stove top for a couple of minutes until the butter melts. Then, pour over your peanuts and sprinkle with salt. Word to the wise – do not, I repeat, DO NOT touch that hot honey—> I touched the hot honey? What the heck was I thinking? My gut got the best of me. Weeeeeeeell, let me tell you. The sound that I let out was ungodly. I swear the neighbours heard me. I freaked the fur baby out and everything. So, listen, don’t touch hot honey, ok? Melt butter into honey on stove top and whisk to combine. Stir in cayenne. Pour over raw (unsalted) peanuts and stir to combine. Spread peanuts onto parchment lined baking sheet, sprinkle with salt and bake 5 minutes. Stir nuts, rotate pan and bake another few minutes. Place in a bowl and stir a little (clumps will naturally form as they cool). Break into desired size clusters. Start out with ‘unsalted’ peanuts. Use the best quality honey you can find. Love a little more heat? Add a touch more cayenne. 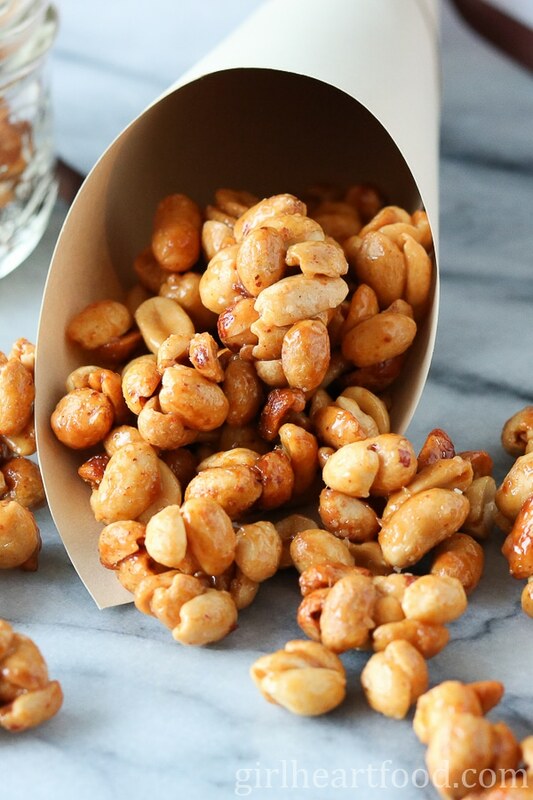 A little pinch of salt really does these honey roasted nut clusters wonders! It has that whole sweet/salty situation goin’….which I LOVE!! A larger flaked salt works better than, say, table salt. Watch these peanut carefully! Like all nuts, they can burn fast and ovens can vary! Check on after 5 minutes. No one wants burned nuts. No one. After they’ve baked, you can sprinkle with a touch more salt and let sit for a couple of minutes. Then, place in bowl and stir until cooled. These nuts will naturally stick to each other in little clusters cause of the honey so what you are left with is little bites of goodness. These peanut clusters make for a delicious homemade food gift or even a hostess gift over the holiday season. Package them up nice and pretty and they definitely will be well received! Whenever you are craving a snack, whip these up; you won’t be disappointed! Until next time, take care and chit chat again soon? Five ingredients and only 15 minutes and you're on your way to one of the most addictive snacks you'll ever have. Wildflower Honey is combined with a touch of cayenne pepper, butter and salt to make salty, sweet nut clusters that you're going to find hard to resist. 1/4 cup wildflower honey -or your fave. In a small, heavy bottomed pop on medium heat melt butter into honey (or, alternatively, melt in a microwave safe bowl for 45-60 seconds). Stir in cayenne pepper. Preheat oven to 350F. Place peanuts in a bowl and pour honey/butter mixture over top and stir to combine. Spread peanuts out evenly on a parchment lined baking sheet and sprinkle with 1/2 tsp of salt. Bake 5 minutes. Carefully remove pan from oven and stir nuts and rotate pan and bake for another 4-5 minutes. Remove from oven and sprinkle with another 1/4 tsp of salt. Let sit a minute or two and then place in a bowl. Stir. You want little clumps of nuts (about 3-5) in a clump (they will naturally stick together). Stir every couple of minutes until cooled slightly, breaking up, as desired. Yields 2 cups. Enjoy! Where have these nuts been all my life?! I never imagined how easy they would be to make. I love the salty sweet combination and the fact that I can control what I’m putting on them. This will be my go-to snack for movie nights! Haha!! They are pretty tasty 🙂 Hope you get a chance to try them soon! Thanks Kelly! I missed these when you posted them, so I was sure glad to see these on FBC’s yummly/stumbleU share! WOW! Dawn, these look so good! I could eat them by the handful though they would be pretty darn fantastic with yogurt or even as cupcake topping! BTW – I love Anthony Bourdain and LOVE Parts Unknown! Such a fantastic show – wish I had watched his one on Italy before I went there last year! So good! This is such a great treat recipe which is just perfect for a movie night! Can’t wait to prepare this healthy and delicious treat, Dawn! If i saw Bourdain on the streets, I might beg him to take me on his travels as his bag carrier / coffee assistant.. You are not alone in your fandom lol!! I like this simple snack Dawn. I can see myself noshing on it often if it is in my pantry! Haha! Good idea 😉 Thanks so much, Jenny! This salty and sweet combination is my favourite! Looking forward to trying out this recipe! I love that combo too, Jessica 🙂 Hope you enjoy! Thank you! This is exactly my kind of snack! Yum! My goodness – these peanut clusters look so good! I can imagine that they would not last long, either. There is nothing that can compete with the fragrance of roasting nuts, is there? Thanks for the inspiration! Love the simplicity of this recipe! Easy and delicious is a winning combination! These look sooooo good Dawn!! And so addictive, oh my! I would be snacking on these all day. Eeeek to touching hot honey! I’ve made that mistake! It’s like hot wax! PS – how exciting is it that Anthony Bourdain is coming!? Thank you Katherine!! Too cool, huh 🙂 ?! OMG OMG OMG Anthony Bourdain is coming to town? I would totally lose it and go on stalker mode lol! Like, when would you ever get the chance right? So cool! I hope you uhmmm *accidentally* bump into him 🙂 And how yummy are these peanuts? Hard to beat sweet, salty and spicy! YES!! Cool, huh? Haha! So funny 😀 !! Thanks so much, Jolina! I’m swooning over that drippy honey shot and the fact that these look like about the best snack I can imagine! Excited about how simple they are to make – absolutely a must try! In love with these snacky, open-me-a-beer-begging clusters! And you really need to quit teasing with gorgeous shots of drips and drops and all that. Just kidding, keep it up, I sooo enjoy seeing them. On my Beer Snacks board! Hehehe! You made my totally laugh out loud there, Milena 😉 Thanks, my friend, and cheers to ya! I see myself munching on these at the weekend. Licking my sticky, sweet, and salty fingers. You nailed it, Dawn! Haha! Can’t blame ya there 😉 Thanks Sabine!! I can never stop eating honey roasted peanuts… I would eat the whole batch of this for sure!!! I hear ya, Sarah 😉 !! So I’m really curious now what Anthony Bourdain will feature when he comes to your neck of the woods. You’ll have to keep us in the loop there! Maybe he’ll even ask to interview you as a local foodie. 😉 As far as these honey roasted nuts, uh…yes!! I love this recipe. It’s so easy, and it’s perfectly snackable. I’m thinking a batch of these could be a great way to enjoy a Saturday full of college football games for me. Thanks for sharing, Dawn!! Me too! I definitely will keep you guys posted! I can’t wait to watch it 🙂 Thanks David! Such pretty photos! And that honey sounds so delicious, especially in this peanut clusters recipe!! Whenever I see anyone famous, I play it cool and pretend I don’t care because I don’t want to bother them or have them think I’m crazy. And then I always regret it!! So, if you see Anthony in the street, you need to get a picture with him!! Thank you so much, Sues!! I’m so excited to try these I can’t even tell you! THEY LOOK SOOOO GOOD! I’m even more excited about this recipe than if I saw Anthony Bourdain. Because trust me, I’d ask for a picture and be totally embarrassed about it–but it’s Anthony Bourdain! How do you not ask for a picture :). Have a great week, Dawn! Thank you Kathy!! I definitely have 😉 Haha! That is totally possible, lol 😀 Have a great week too! How fun that Anthony Bourdin is coming to your area! I don’t watch his shows too often, but he is fun when I catch him. I would definitely be one of those fan girls and go up to him for a pic! And yay for Monday snacks! I’ve never heard of that honey before, but it sounds delicious. Easy snacks are what my afternoons need, especially when nuts are involved! Pinned! Hope you have a great Monday! OMG Dawn! These look absolutely addictive! I can just tell. Perfect for holiday cocktail parties and holiday gifts! That honey and those flavors sound amazing. Pinning this one for sure!